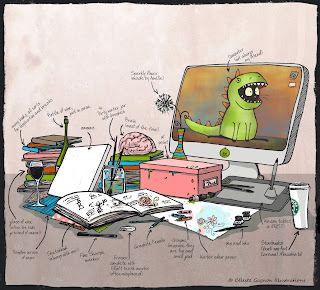 My submission for this weeks Illustration Friday, this is the equipment I use regularly! I LOVE this, especially the starbucks...and bottle of wine(just in case)! this illustration made me smile! Wonderful details! I love the composition as well. Wonderful details and it put a smile on my face :-). Looks like my desk. I especially like the brain. Nice work! thanks everyone for your comments, you are all awesome!